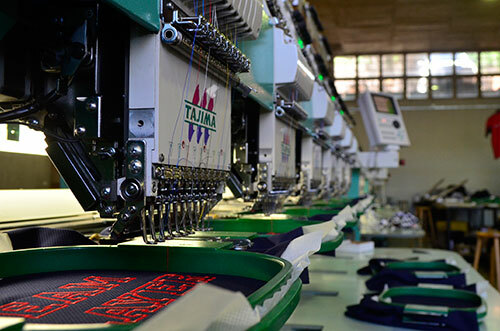 Based in Pinetown, South Africa, our eight computerised Tajima machines are capable of knocking out over 1,5-million stitches per hour, 22 hours a day for applique embroidery design. Our well planned and balanced production line ( two eight-headed machines, two six-headed and four four-headed machines) are precision guided by a Wilcom digitalising programme to repeat multi-colour designs time after time. The flexibility of the system allows our in-house designer, Ronald Bisnath, to copy his artwork onto a memory stick, calculate the exact size and number of stitches used to produce one or any number of garments at the touch of a button. This means our many repeat customers can confidently place orders assured of exactly the same result and on virtually any fabric that can be knitted or sewn. We specialise in SHIRTS, JACKETS, CAPS, HATS, BAGS, TOWELS, CONTI SUITS, OVERALLS & KNITWEAR which we collect and deliver throughout the greater Durban area. 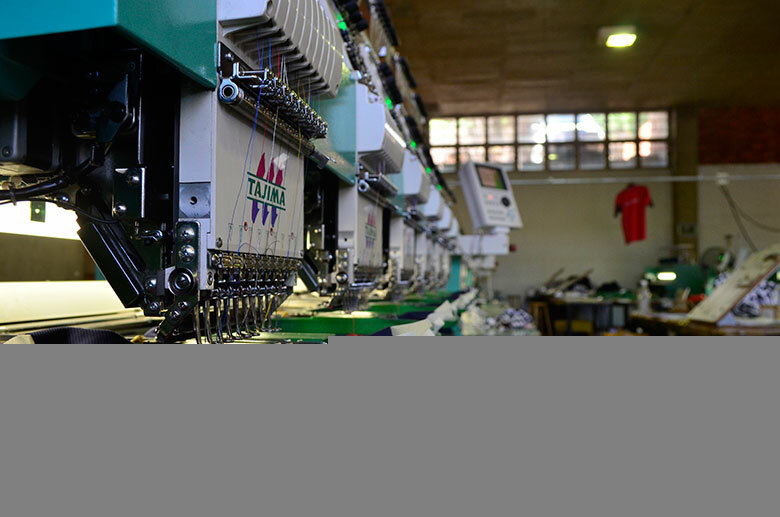 Santon Workwear (Pty)LTD. has been conducting business with Embroidery Studio for the past 8 years. We've always had a very good relationship and the quality of work and service that Embroidery Studio offers is of the highest level. Sandy Pechey - Santon Workwear (Pty)LTD.
Colbar Clothing supplies Corporate Uniforms to a wide cross-section of businesses throughout South Africa, including First National Bank, Spar, McDonalds, Fruit & Veg City, BP and Ocean Basket. We have a long standing relationship with Embroidery Studio (Pty)LTD. We're very happy with the quality of their workmaship and the excellent service they provide. PXP Clothing & Promotions have enjoyed a long standing and successful business relationship with Embroidery Studio worth over R30k pm. We are happy to recommend the quality and service of their product. © 2013 Embroidery Studio. All rights reserved.